Snow White usually does not wake me up until dawn, but the other night she arrived at one o'clock and clearly asked me to follow her into the living room. It was easy to see what she was unhappy about, because the day before we had changed the look of the room completely by pulling down the book shelves. Although we are busy, we make sure that the cats are given more than their usual attention and treats. They have a hard time, but the good thing is that this seems to bring them closer together. There is however, no way for us to explain that the terraced house we bought has a small garden to it. They will be in an enclosure, but it will still be much better than the balcony they've been used to. Anyway, Milly and Snow White have settled in well and are inventing new routines for themselves. Each night at 9 Snow White scratches the bedroom door asking for us to open it. She then sneaks under our bed where she rests until we go to bed. Then she jumps up and lies down next to my feet. That is wonderful Finn, well done ! It has opened up a whole safe new world for your cats and is a shining example that if you look for one,there is always a way to make their lives more fulfilled. No more balcony worries for us. I know I always got skittish with your balcony experiences. It's nice to know they are safe and can still look out at the world. Your cats look like they've really settled in, particularly Snow White, I've never seen a photo which describes a content cat so well! Hi Finn, I'm glad your move went well and you are all settling in and starting to feel at home. Cats are very adaptable aren't they ! I'll look forward to hearing about your new enclosure for them. I hope you all have many many happy years together there. Now it's been two weeks since we moved into our new home. The day before we pulled down Milly's big cat tower and she was very unhappy with that, refusing to move away from the parts scattered across the floor. But next day when she refound it at the new home, her joy was even bigger when she climbed it and found security in her favourite hammock. That surely helped her a lot into accepting the relocation. Both cats spent a couple of hours exploring the house, searching out food, litter trays, good resting points and hideouts. None of them are used to walking at stairs, but adapted in no time. Well, surely shelter cat Snow White must have known stairs from her previous life, because in no time she started running down them with speed and grace. Milly is the more careful type, but she has picked up on it too, although a little slower. Next thing they had to explore was of course the enclosed verandah. They moved into it with great care, sniffing to everything before they sat down watching the scenery. The Wide World is almost too big for Milly and she usually soon retreats back in, but still first thing she has to do every morning is checking the outside. Goes with the territory of being No.1 Cat, I suppose. Snow White spends a lot of time outside looking out for birds and other cats. Sometimes black Molly from next door drops by and sits down right in front of the enclosure. Then they'll sit watching each other for a while until black Molly yields. Snow White of course never yields - she knows this garden is her property. I'll be back with details of the enclosure in a seperate article. Well Finn, you've made it to the final stretch! The hardest part...well, except for the unpacking. Wishing you an easy time of it. In a months time, you and the cats will feel right at home. And you have a whole slough of folks here on POC sitting on pins and needles to see how the cats will fair. We'll bug you about the enclosure later. Hi all. The moving boxes have been piling up over the last few weeks, creating an interesting landscape for the cats to explore. They are curious about everything we do, but now seems to be more at ease now with things being moved around. Jun 14, 2010 They'll love it when you do the enclosure! All the best with your move; your kitties are so lucky that you think so much of them. I love their photo's by the way; cats really are so curious aren't they? It looks as though Snow White is "Thinking inside the box". Or even on top of the box, as it were. 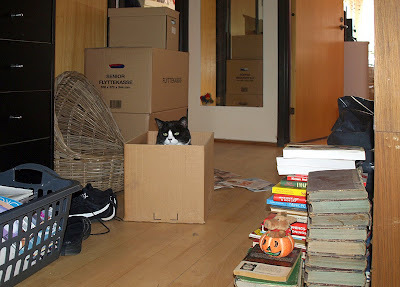 The angst of moving is quadrupled when you have pets. They just don't get it. But as soon as they sleep in your new house on the same old bed, with all the familiar smells, they will be happy campers. And oh, the new yard! That is very exciting. I'll look forward to stories about the move and the transition. Although packing usually also means cleaning, we won't clean the cats' favourite baskets and pillows too much. I reckon having their own familiar smells around will make the transition easier for them. I've promised my wife that when we take over the property, first thing I do is building a secure cat enclosure. It's just a small garden, about 70 square metres in all, but it has a fairly large verandah or patio (17 m²), which easily can be turned into what I call the 'high security cat aviary'. That will be the first stage of the project. The rest of the garden will have to wait until next spring, but my idea is to put a tall fence of chicken net inside the hedges. The actual construction still needs some studying on my part, but there is plenty of good advice to be found on the net as how to. I'll keep you posted as we move along. to have such caring Humans. It sounds as though you are doing everything you can to make sure the transition goes smoothly. Please keep us posted! Good luck with your move Finn. We moved here with Bryan and Ebony, the 2 cats we had at that time, both were 9 years old. They were quite upset to see the packing being done and we were concerned about the fact that we'd have to keep them in at first as they were used to their freedom. But the move went smoothly and they settled in no time, got used to the house first,then the garden and soon were venturing further afield as if they'd always lived here. I'm sure your cats will love having a enclosure.When we built the one next door those cats could hardly wait to get out in it. I'll look forward to hearing all about how your cats take to your new home. This is going to be an interesting story and at first hand. As you say, Finn, cats like their routine and so do we. So I hope you can find the time to write a follow post when they and you are installed at their new home with enclosure. Please show us the enclosure..:) You know I am a crazy enclosure fan. Thanks for sharing again, Finn. This is a new topic for PoC and an interesting one. And thanks for using the GIF avatar. This entry was posted in Cat Behavior and tagged behavior of cats, cat behavior, cat relocation anxiety by Michael Broad. Bookmark the permalink.